The Iberian pig has dark skin with a sparse coat, a pointed snout, and long, slender legs. The genetic trait of this breed is its ability to store fat in muscle tissue, the key to the unmistakeable flavour and texture of Iberico jamones. The Iberian jamones are characteristically long and slender. The hoof is dark ( pata negra literally means "black hoof"), and the flesh ranges in colour from rosy to purplish red. The texture is soft, with fat that is lustrous, fluid and soft to the touch. The dehesa pastureland is one of the best preserved ecosystems in Europe, where livestock breeds (Iberian pigs, merino sheep, retinto ) live side by side with wild species (deer, wild boars, rabbits, hares, wild cats, imperial eagles, black vultures, cranes, and lizards). Iberian pigs consume a staple diet of acorns (the fruit of holm and cork oaks), supplemented by wild grasses and berries, and legumes. Actual consumption depends on the animal's weight, although 6 to 10 kg of acorns per animal/day is considered normal, in addition to about 3 kg of grass daily. 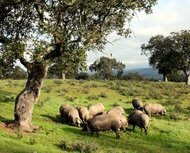 Because the dehesa pasture ecosystem is limited in size, with no more than 50 holm oaks per hectare, production of Iberian pigs is limited to just over a million head of livestock. The adoption of new technologies and health requirements has led to improved jamon quality, but the experience and know-how of jamon experts, in a tradition passed down over the centuries from father to son, continues to be essential. Salting and washing. After pigs are slaughtered, jamones are covered with sea salt for a week or ten days, depending on weight. Temperature of the room needs to be between 1º and 5º C, and relative humidity is usually kept around 80 or 90%. After this period the jamones are washed in lukewarm water to remove salt crystals from the surface. Resting period. Once washed, the jamones are kept for 30 to 60 days in rooms at a temperature between 3º and 6º C and a relative humidity of 80 or 90%. During this period the salt penetrates the pieces uniformly, enhancing dehydration and conservation. This process gives jamones a significantly denser consistency. Drying and maturation. During this period jamones are moved to a "secadero" , or natural drying area, where temperature and humidity are controlled, essentially with ventilation mechanisms. Temperature ranges from 15º to 30º C for the 6 to 9 month drying period, during which jamones continue to lose moisture, and "sweating" - dissemination of fat throughout the muscle fibres, which then retain the aroma they have acquired - also occurs. The final flavour and aromas begin to develop during this stage, due to a series of changes that occur in the protein and fat of these jamones. Bodega phase. Iberico jamones are hung in cellars, or bodegas , for at least 6 and up to a maximum of 30 months. Temperature may range between 10º and 20º C, and relative humidity, between 60 and 80%. During this phase, jamones continue to undergo the biochemical processes initiated during the curing process, enhanced by microbial flora which give them their particular aroma and final flavour. The Producers' Association of each Designation of Origin exercises stringent control over the entire production process. The Producers' Association is responsible for identifying and branding pigs in their grazing areas, and overseeing their diet during the finishing period. It then monitors slaughter of the animals, and jamones and paletas (shoulder hams) are given an indelible, numbered tag, for supervision of the entire maturation process. Other controls performed verify the saline concentration of brine, and ensure observation of minimum periods for drying, and aging in cellars. Jamón de Bellota grade: The pig enters the finishing period weighing 80-105 Kilos, and replaces about 60% of its entry weight on a diet of acorns and grasses. Jamón de Cebo de Campo grade: The animal has a varied diet, including feeds authorized by the Producers' Association and herbage from the dehesa pastureland, in an area that is completely or partially uncovered with a minimum of 100 m2 available per animal. Labels may also refer to genetic characteristics of the animal, distinguishing between 100% Iberian Pigs (purebred) and cross breeds (which are at least 75% Iberian bloodstock). All of the farms and industries involved in the process of jamon production are registered with the Producers' Association. Quality control of products without D.O. At present the State Administration delegates the tasks of inspection and control to private companies. All breeders wishing to label their jamones as "ibérico" (Iberian) must contract with one of these companies and pass the inspection checks, whether or not the breeder is registered with a D.O. In past years labeling depended on the results of tests run on samples taken in the slaughterhouse. These analyses were not sufficiently reliable because some compound feeds were designed in such a way as to achieve a fatty acid content similar to that of acorns (for example, including soya in them). The current method is not infallible either. Similar to the situation with external audits carried out in large companies, these inspection organizations must monitor their own clients, the breeders. In such a small, concentrated market with barely a dozen large manufacturers, losing a client can have a major impact on the earnings of the certifying company. Spain has four regions where D.O. (designation of origin) Iberico jamones are produced: Extremadura, Guijuelo (Salamanca), la Sierra de Huelva (where the town of Jabugo is located), and Los Pedroches (Córdoba). There are also large expanses of woodland in the Alentejo in Portugal which until recently were underused. The Presunto de Barrancos Protected Designation of Origin was created in 1996 for jamones from indigenous Iberian pigs of the breed known as "Alentejano". This is considered one of the purest of the Iberian breeds thanks to its isolation over a recent period of several centuries. Production of Iberian pork products is especially widespread throughout Extremadura, making this region the foremost producer in Spain. Here, almost a million hectares of dehesa rangeland are used for grazing by nearly 1500 livestock farms. The principal production areas are the mountain range of southwestern Badajoz (1), Ibor and Villuercas (2), Southern Gredos (3), Sierra de Montánchez mountains (4) and Sierra de San Pedro mountains (5). It is in these areas that the majority of the hundred or so existing production enterprises are located. Teruel also produces its share of quality jamon, although not from Pata Negra Iberian pigs but from "white pigs" whose parent stock, boars and sows, are purebred Durocs and Landrace-Large White crossbreeds, respectively.